The European patient handling equipment market is estimated to grow at a CAGR of 11.4% to reach $5,150.2 million by 2019. The nonmechanical equipment product segment is expected to witness the fastest growth during the forecast period. In this report, the market is broadly segmented on the basis of product, type of care, end user, accessories and geography. On the basis of products, the European patient handling equipment market is broadly segmented into wheelchair and scooters, medical beds, bathroom safety supplies, mechanical equipment, nonmechanical equipment, ambulatory aids, and others (stretchers, transfers, hospital furniture, and evacuation equipment). The wheelchair and scooters segment is bifurcated into wheelchairs and scooters. The wheelchair segment is further bifurcated into manual wheelchairs and powered wheelchairs. The medical beds segment is divided into curative care beds, psychiatric care beds, long-term care beds, and others. On the basis of type of care, the European patient handling equipment market is broadly classified into bariatric care, fall prevention, critical care, wound care, and others (acute care and long-term care). Wound care is the largest segment of this market. On the basis of end users, the market is classified into home care, hospital, elderly care, and others (emergency medical services, long-term acute care facilities, trauma centers, and nursing homes). Hospitals are the major end users of this market. On the basis of accessories, the market is segmented into lifting accessories, transfer accessories, evacuation accessories, stretcher accessories, hospital-bed accessories, and others (bathroom safety supplies such as safety frames, grab bars, bariatric aids, and shower chairs; and ambulatory aids such as wheeled walkers, lift chairs, folding walkers, and canes). Lifting accessories accounted for the largest share of this segment. 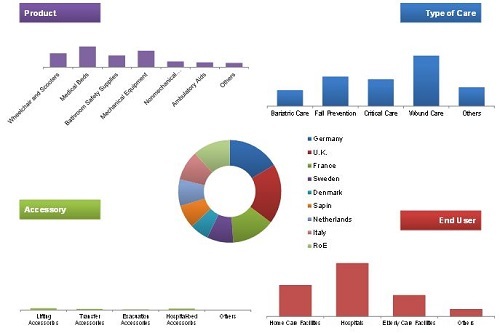 The European patient handling equipment market by region is segmented into Germany, the U.K., France, Sweden, Denmark, Spain, the Netherlands, Italy, and Rest of Europe (RoE). Growth of this market is propelled by the increasing incidences of lifestyle diseases and high recovery cost from injuries promoting use of equipment. However, lack of skilled training and knowledge to handle patients and persistent difficulty in handling obese patients are the key factors limiting the growth of this market. Key players operating in the European patient handling equipment market are ArjoHuntleigh, Inc. (Sweden), Guldmann, Inc. (Denmark), Linet, Inc. (Czech Republic), Stiegelmeyer, Inc. (Germany), and Handicare, Inc. (Norway), Benmor Medical Ltd (U.K.), Sidhil Ltd (U.K.), Spectra Care Group (U.K.), Mangar International Ltd. (U.K.), and Etac Ltd. (U.K.). This research report categorizes the European patient handling equipment market on the basis of product, type of care, accessory, end user, and region. The European patient handling equipment market is expected to grow at a double-digit CAGR of 11.4% to reach $5,150.2 million by 2019. Factors such as rising geriatric population, increasing incidences of lifestyle diseases, and high recovery cost from injuries resulting from manual handling of equipment are driving the growth of this market. However, lack of skilled training and knowledge to handle patients and persistent difficulty in handling obese patients are hindering the growth of this market. On the basis of products, the market is segmented into wheelchairs and scooters, medical beds, bathroom safety supplies, mechanical equipment, nonmechanical equipment, ambulatory aids, and others (stretchers, transfers, hospital furniture, and evacuation equipment). The wheelchairs and scooters segment is bifurcated into wheelchairs and scooters. The wheelchair segment is further bifurcated into manual wheelchairs and powered wheelchairs. The medical beds segment is divided into curative care beds, psychiatric care beds, long-term care beds, and others. On the basis of type of care, the European patient handling equipment market is segmented into bariatric care, fall prevention, critical care, wound care, and others (acute care and long-term care). Critical care is the fastest-growing segment of this market due to the rising aging population and disabilities from non-communicable diseases. On the basis of accessories, the market is segmented into lifting accessories, transfer accessories, evacuation accessories, stretcher accessories, hospital-bed accessories, and others (bathroom safety supplies such as safety frames, grab bars, bariatric aids, and shower chairs; and ambulatory aids such as wheeled walkers, lift chairs, folding walkers, and canes). On the basis of end users, the European patient handling equipment market is categorized into home care facilities, hospital, elderly care facilities, and others (emergency medical services, long-term acute care facilities, trauma centers, and nursing homes). Hospitals are the major end users of the market. Geographically, the market is dominated by THE U.K., followed by Germany. France is expected to grow at a double-digit CAGR during the forecast period. Key players operating in the market are ArjoHuntleigh, Inc. (Sweden), Guldmann, Inc. (Denmark), Linet, Inc. (Czech Republic), and Stiegelmeyer, Inc. (Germany). 4.3. Chiltern Invadex (UK) Ltd.
4.5. Reanimed Healthcare System Ltd.